Exosomes are nanovesicles released by different cell types including dendritic cells (DCs). The fact that exosomes express surface MHC-peptide complexes suggests that they could function as Ag-presenting vesicles or as vehicles to spread allogeneic Ags for priming of anti-donor T cells during elicitation of graft rejection or induction/maintenance of transplant tolerance. We demonstrate that circulating exosomes transporting alloantigens are captured by splenic DCs of different lineages. Internalization of host-derived exosomes transporting allopeptides by splenic DCs leads to activation of anti-donor CD4 T cells by the indirect pathway of allorecognition, a phenomenon that requires DC-derived, instead of exosome-derived, MHC class II molecules. By contrast, allogeneic exosomes are unable to stimulate direct-pathway T cells in vivo. We demonstrate in mice that although graft-infiltrating leukocytes release exosomes ex vivo, they do not secrete enough concentrations of exosomes into circulation to stimulate donor-reactive T cells in secondary lymphoid organs. Instead, our findings indicate that migrating DCs (generated in vitro or isolated from allografts), once they home in the spleen, they transfer exosomes expressing the reporter marker GFP to spleen-resident DCs. Our results suggest that exchange of exosomes between DCs in lymphoid organs might constitute a potential mechanism by which passenger leukocytes transfer alloantigens to recipient’s APCs and amplify generation of donor-reactive T cells following transplantation. One of the mechanisms responsible for transplant rejection is the effector T cell response against donor allogeneic Ags (alloantigens). Activation of donor-reactive T cells requires presentation of alloantigens by dendritic cells (DCs)3 through different pathways of allorecognition (1, 2). Donor DCs present intact donor MHC molecules to T cells via the direct pathway, whereas recipient DCs present allopeptides loaded in self-MHC molecules to T lymphocytes by the indirect pathway. Following transplantation, DCs mobilize as passenger leukocytes from the graft to secondary lymphoid organs of the recipient, where they interact with anti-donor T cells (3, 4). Additionally, these migrating DCs could amplify indirectly the generation of donor-reactive T cells by transferring alloantigens to DCs that reside constitutively in lymphoid organs. There is evidence that DCs can acquire Ags and immunogenic peptides from neighboring cells (5) through internalization of fragments of plasma membrane, a phenomenon termed “cell nibbling” (6), microvesicles shed by apoptotic cells (7, 8, 9), or nanovesicles released by living cells (10, 11, 12). Exosomes are nanovesicles (<100 nm) generated by reverse budding of the limiting membrane of multivesicular bodies (MVBs) that are released to the extracellular milieu by fusion of the MVBs with the cell membrane (13, 14). Although exosomes were originally described in maturing erythocytes (15, 16), these vesicles are also released by normal cells of different lineages and tumor cells, and are present in organic fluids (13, 17). The biological role of exosomes has not been completely elucidated (13, 14). Exosomes can transfer proteins and likely RNA between cells in steady-state and pathological conditions (18, 19, 20, 21). Exosomes have also been used therapeutically as vaccines against neoplasms and for negative vaccination to prevent/treat autoimmune disorders and allograft rejection (22, 23, 24, 25, 26, 27). Although there is evidence that exosomes released by APCs are rich in MHC-peptide complexes topologically oriented with their binding domains facing outward (13, 14), the role of these nanovesicles in allorecognition is still unknown (28). In this study, we demonstrate that graft-infiltrating leukocytes (GILs) contain exosomes and that graft-infiltrating DCs (GIDCs) release exosomes ex vivo. Bloodborne exosomes carrying alloantigens are internalized and reprocessed by different subsets of DCs of secondary lymphoid organs for presentation to anti-donor T cells. Our results in mice show that, despite the fact that GILs are a rich source of exosomes, cardiac or skin allografts are unable to release enough amounts of exosomes into circulation to activate donor-reactive CD4 T cells in the spleen. Instead, our findings suggest that migrating DCs, generated in vitro or purified from GILs, traffic to the spleen and transfer exosomes to spleen-resident DCs, suggesting a potential mechanism by which passenger leukocytes could transfer alloantigen to recipient’s APCs during elicitation of the anti-donor T cell response in transplantation. C57BL/10 or C57BL/6J (B10 or B6), BALB/c, B6.MLR-Faslpr/J (Fas−/−KO), B6.129-H2dlAb1-Ea/J (MHC II−/−KO), and C3H mice were from The Jackson Laboratory. 1H3.1 mice and the Y-Ae mAb were provided by C. Janeway (Yale University, New Haven, CT). Studies were approved by the Animal Care and Use Committee. GM-CSF was purchased from PeproTech; IL-4 from R&D Systems; PKH67, ionomycin, and LPS from Sigma-Aldrich; and OxyBURST (succinimidyl ester of 2′,7′-dichlorodihydrofluorescein or H2DCF) from Molecular Probes. The recombinant adenovirus (RAd) encoding for Fas ligand (FasL) and the enhanced GFP (eGFP), RAd-FasL-eGFP, was provided by J. Dong (University of South Carolina, Charleston, SC). All mAbs were from BD Pharmingen, unless specified. The mAb 2422 against milk fat globule-E8 (MFG-E8)/lactadherin was provided by S. Nagata (Osaka University, Osaka, Japan). Bone marrow-derived DCs (BMDCs) and splenic DCs were prepared as described (9, 12). Splenic DCs were further purified with bead-CD11c mAb and magnetic sorting (Miltenyi Biotec) at a purity ≥92%. For isolation of GILs, allografts were perfused with heparinized 0.9% saline, minced, and digested with 250 U/ml collagenase. To clear the debris, cell suspensions were passed through glass wool columns, then mixed with Percoll solution to a concentration of 30%, and centrifuged (800 × g, 15 min). GIDCs (CD11c+) were purified from the GILs by magnetic sorting (Miltenyi Biotec). B10 or B6 (IAb) BMDCs were pulsed on day 5 with IEα52–68 peptide (ASFEAQGALANIAVDKA) (50 nM) for 3 h and maintained in medium with exosome-free FCS. Mature IAb-IEα52–68 exosomes were generated from BMDCs pulsed with IEα52–68 and incubated with 200 ng/ml LPS. BALB/c exosomes were generated from BALB/c BMDCs. BMDCs (day 6) were incubated with 100 nM ionomycin (1 h) and supernatants were centrifuged at 300 × g for 10 min, 1200 × g (20 min), 10,000 × g (30 min), and then ultrafiltered (2000 × g, 20 min) through a Vivacell 100 filter. The filtered supernatant was adjusted to 10 ml with PBS and ultracentrifugated (100,000 × g, 60 min) on top of 1.6 ml of 30% sucrose/D20 density cushion (29). The phase containing the exosomes was collected, adjusted to 10 ml of PBS, and pelleted (100,000 × g, 60 min). Exosomes were purified from mouse serum as described (30). The amount of exosome protein was assessed by Bradford assay (Bio-Rad). For FACS analysis, exosomes were attached to 4.5-μm Dynabeads (Dynal Biotech) precoated with CD81 mAb, and labeled with the following PE mAbs: H2Db, IAb, IAb-IEα52–68 (Y-Ae), H2Dd, IAd, CD86, or lactadherin (clone 2422). Exosomes (20 μl) fixed with 4% paraformaldehyde were loaded on Formvar/carbon-coated grids, negatively stained with 1% uranylacetate, and examined with a JEM-1011 transmission electron microscope. BALB/c exosomes were labeled with IAd mAb plus 5-nm gold-conjugated secondary Ab (GE Healthcare) and incubated with B10 BMDCs. Then, the BMDCs were fixed in paraformaldehyde, embedded in 3% gelatin, incubated in 2.3 M sucrose, frozen, and sectioned. Grafts were fixed with paraformaldehyde, processed as described, and cryosection-labeled with rat lysosomal-associated membrane protein (LAMP)-1 mAb followed by 12-nm gold-conjugated anti-rat IgG (Jackson ImmunoResearch Laboratories). Fas−/−KO BMDCs transduced with RAd-FasL-eGFP were fixed in paraformaldehyde and processed as described, and sections were labeled with anti-GFP Ab (Abcam) and 5-nm gold-conjugated secondary Ab. For trafficking studies, exosomes generated by BMDCs in vitro or isolated from serum were labeled with PKH67 and injected i.v. At different time points (3, 24, and 48 h), the host mice were euthanized and splenic DC-enriched suspensions were labeled with CyChrome-CD11c, PE-CD45RA, and allophycocyanin-CD8α mAbs and analyzed by FACS. For in vitro studies, FACS-sorted splenic DCs and B and T cells purified by magnetic sorting (Miltenyi Biotec) were incubated (30 min, 37°C) with exosomes labeled with OxyBURST (1.5 × 104 cells/40 μg of exosomes), followed by labeling with CyChrome-conjugated CD11c, CD3, and CD19 mAb, paraformaldehyde fixation, and FACS analysis. For detection of exosomes on the cell surface, BMDCs were incubated with OxyBURST-labeled exosomes, washed in cold PBS, fixed in 4% paraformaldehyde, oxidized by gentle bubbling with compressed air, labeled with PE anti-FITC Ab (Molecular Probes), and analyzed by FACS. BMDCs were attached to poly-l-lysine-coated slides, paraformaldehyde-fixed, and surface labeled with biotin-CD11c mAb followed by CyChrome 3-streptavidin. Images were analyzed with a Leica Microsystems TCS-NT confocal microscope. Splenic 1H3.1 CD4 T cells were double-purified by first depleting CD8, B220, IAb, F4/80, and NK1.1-expressing cells (Dynabeads) followed by purification with CD3 T cell enrichments columns (R&D Systems). A total of 2 × 104 gamma-irradiated (B10 or B6) BMDCs per well (96-well plates) untreated (control), or preincubated (3 h) with IAb-IEα52–68 exosomes, free IEα52–68 peptide or serum exosomes were used as stimulators of 1H3.1 cells (105 T cells/well). Cell proliferation was evaluated 72 h later by assessment of [3H]thymidine incorporation. For other in vitro studies, IAb-IEα52–68 exosomes were attached to 4.5-μm Dynabeads coated with CD81 mAb and used as stimulators of 1H3.1 T cells labeled with 5 μM CFSE (Molecular Probes). Five days later, cells were labeled with CyChrome-CD4 mAb and PE-CD69 mAb and analyzed by FACS. For in vivo studies, 1H3.1 CD4 T cells were labeled CFSE and i.v. administered (7 × 106 cells/mouse). For analysis of the direct pathway, CD3-depleted (Dynabeads) splenic APCs from B10, BALB/c, or C3H mice were gamma-irradiated and used as stimulators of splenic T cells purified by negative selection (Dynabeads) followed by T cell enrichment columns (R&D Systems) from B10 mice i.v. injected (7 days before) with BALB/c or B10 exosomes or BALB/c splenocytes (control). Cryostat sections of heart allografts were fixed in ethanol and incubated with Alexa Fluor 488-CD11c mAb or Alexa Fluor 488-F4/80 mAb (Caltag Laboratories) and 1) biotin-IAd or biotin-IAb mAbs plus CyChrome 3-streptavidin or 2) LAMP-1 mAb plus CyChrome 3-anti-rat IgG. Sections of spleens, lymph nodes, thymi, livers, and lungs were incubated with the following biotin-conjugated mAbs: CD3, CD11c, MOMA-1 (Bachem), or F4/80 (Bachem); followed by CyChrome 3-streptavidin. Cytospins of splenic DCs were incubated with 1) CD11c mAb and biotin-CD45.1 mAb (or biotin-CD45.2 mAb) followed by CyChrome 5-anti-hamster IgG and CyChrome 3-streptavidin; 2) LAMP-1 mAb and biotin-CD45.1 mAb followed by CyChrome 5-anti-rat IgG and CyChrome 3-streptavidin; or 3) biotin-CD45.1 mAb followed by CyChrome 5-streptavidin plus the TUNEL In Situ Cell Death Detection kit (TMR red; Roche). Nuclei were stained with DAPI (4′,6′-diamidino-2-phenylindole; Molecular Probes). Cell pellets and exosomes were resuspended in 50 mM sodium phosphate, 1% v/v SDS, 40 mM 2-ME, 2 mM EDTA. Cell extracts and exosomes were diluted in 0.125 M Tris-HCl, 4% v/v SDS, 20% v/v glycerol, 0.2 M DTT, 0.02% v/v bromphenol blue (pH 6.8), boiled, and loaded in 4–20% gradient acrylamide precast gels (Bio-Rad). Gels were electroblotted on polyvinylidene difluoride membranes (Millipore). Membranes were labeled with rabbit anti-mouse heat shock protein 70 Ab (Santa Cruz Biotechology, CA) or I-Ab mAb, followed by peroxidase anti-rabbit IgG or peroxidase anti-mouse IgG (Santa Cruz Biotechnology). Staining was developed by chemiluminescence (SuperSignal; Pierce). Intra-abdominal cardiac transplantation and skin transplantation were performed as described (31). Results are expressed as mean ± SD. Comparisons between mean values were performed by ANOVA, followed by the Student Newman Keuls test. Comparison between two means was performed by Student’s t test. A value of p < 0.05 was considered significant. We investigated the ability of GIDCs to release exosomes ex vivo. Three days after transplantation of BALB/c hearts in B10 recipient mice, the grafts were infiltrated predominantly by recipient’s (IAb+ IAd−) CD11c+ DCs (Fig. 1⇓, a and b) and F4/80+ macrophages (Fig. 1⇓c), both containing vesicles expressing LAMP-1, a marker present in MVBs (Fig. 1⇓d). Ultrastructural analysis of GILs confirmed the presence of LAMP-1+ MVBs containing exosomes (Fig. 1⇓, e and f). GIDCs (CD11c+) isolated from cardiac allografts 3 days after transplantation released exosomes in culture supernatants (3 μg/GIDCs pooled from 8 grafts/16-h culture) (Fig. 1⇓g). GIDCs release exosomes. a–c, Three days after transplantation of BALB/c (IAd) hearts into B10 (IAb) recipients, the grafts were infiltrated by recipient’s (IAb+ IAd−) CD11c+ DCs (a and b, arrow indicates inset) and (IAb+) F4/80+ macrophages (c, arrow indicates inset). a, Donor MHC class II molecules (IAd) were also expressed by myocardial fibers of the BALB/c allograft (asterisk). Yellow results from overlap of green and red. d, Detection of LAMP-1 in vesicles of CD11c+ GIDCs (arrow indicates inset). e and f, Detection by immunoelectron microscopy of exosomes (arrow indicates inset) within MVBs of GILs labeled with 12-nm gold-conjugated LAMP-1 mAb (arrowheads). g, Whole-mount preparation of exosomes released into culture supernatants by GIDCs isolated from cardiac allografts, 3 days after transplantation. Data are representative of n = 8 allografts. a–d, Fluorescence microscopy is at magnification ×200. Insets are at magnification ×1000. Nuclei were stained with DAPI. e–g, Electron microscopy at magnification ×100,000. Previous studies have shown that stimulation of T cells in vitro by exosomes requires the presence of DCs (32, 33). Thus, exosomes released by GIDCs systemically into circulation or by graft-migratory DCs in the spleen or lymph nodes should interact with lymphoid organ-resident DCs to stimulate donor-reactive T cells. To address this point, we first investigated the ability of different splenic DC subsets to internalize syngeneic (B10) BMDC-derived exosomes loaded with the BALB/c allopeptide IEα52–68 (IAb-IEα52–68 exosomes) or allogeneic (BALB/c) exosomes. PKH67-labeled (green) IAb-IEα52–68 exosomes included 40–100 nm vesicles (Fig. 2⇓a) positive for MHC molecules, IAb-IEα52–68, CD86 and the exosome marker MFG-E8/lactadherin (Fig. 2⇓b). Three hours after i.v. injection, PKH67+ IAb-IEα52–68 exosomes were taken up by DCs and metallophillic macrophages of the marginal zone (Fig. 2⇓, c and d) and by red pulp macrophages (Fig. 2⇓e) of the spleen. After 24 h, PKH67+ DCs were detected in T cell areas of splenic follicles (Fig. 2⇓, f and g). Bloodborne PKH67+ exosomes were also captured by Kupffer cells (F4/80+) of the liver and by DCs (CD11c+) and macrophages (F4/80+) of the lung (data not shown). No PKH67+ cells were detected in lymph nodes or thymus. Similar findings were obtained after injection of PKH67+ BALB/c exosomes. Traffic of exosomes in vivo. a, Ultrastructure of exosomes isolated from culture supernatants of BMDCs. b, FACS analysis of IAb-IEα52–68 exosomes attached to 4.5-μm beads-coated with CD81 mAb. 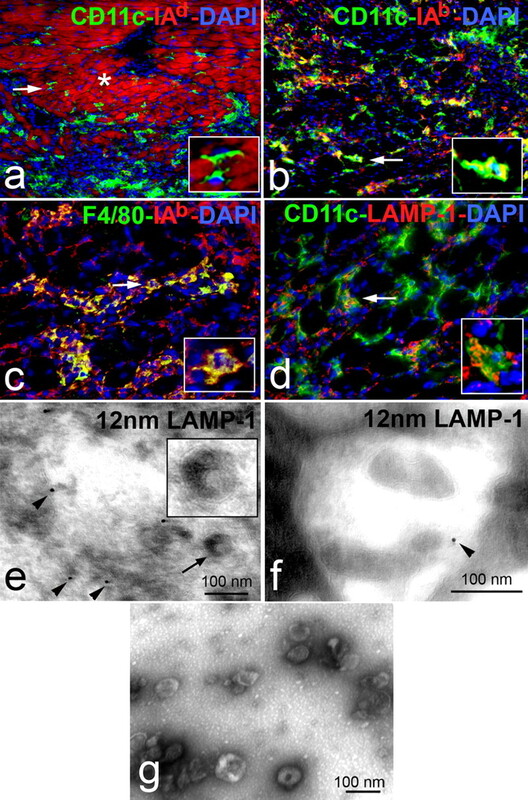 c–g, Traffic of circulating PKH67 exosomes analyzed by fluorescence microscopy of tissue sections. Three hours after i.v. injection (100 μg of exosomes/mouse), PKH67+ exosomes were trapped in the spleen by marginal zone CD11c+ DCs (c) and MOMA-1+ metallophillic macrophages (d) and by F4/80+ macrophages (e). Twenty four hours later, DCs with intracellular PKH67 were detected in the T cell area of the splenic follicles (f and g). Data represent three independent experiments. h, Analysis by FACS of internalization of circulating PKH67+ exosomes by splenic myeloid (CD11chigh, CD8−), lymphoid-related (CD11chigh CD8α+), and plasmacytoid DCs (CD11cint, CD45RA+) in vivo. i, Ability of different subpopulations of FACS-sorted splenic cells to internalize H2DCF exosomes in vitro. The green fluorescence generated by oxidation of H2DCF into dichlorofluorescein following internalization of the exosomes was assessed by FACS. Data represent three independent experiments. Electron microscopy is at magnification ×100,000 (a) and fluorescence microscopy at magnification ×200 (c–g). Magnification for insets is at ×1000. Nuclei were stained with DAPI. Next, we assessed by FACS the ability of different subsets of splenic DCs to internalize circulating exosomes. Three hours after injection (i.v. ), PKH67+ exosomes were captured by CD11chighCD8− myeloid DCs (4.5 ± 1.6% DCs vs 0.8 ± 0.3% DCs in noninjected controls), CD11chighCD8α+ lymphoid-related DCs (8.9 ± 0.7% DCs vs 0.9 ± 0.5% DCs in controls) and CD11cintCD45RA+ plasmacytoid DCs (6.6 ± 1.6% DCs vs 0.3 ± 0.1% DCs in controls) (Fig. 2⇑h). To investigate whether the exosomes were internalized or attached to the DC surface, we used exosomes labeled with H2DCF, a dye that becomes fluorescent green following oxidation into dichlorofluorescein. Analysis by FACS confirmed that FACS-purified splenic CD8− and CD8α+ and plasmacytoid DCs internalized H2DCF exosomes into vesicles of low pH, based on the green fluorescence generated by oxidation of H2DCF (Fig. 2⇑i). Unlike DCs, splenic T and B cells showed poor or no ability to internalize H2DCF exosomes in vitro (Fig. 2⇑i). Because our results showed that splenic DCs internalize exosomes in vivo, we investigated the ability of these APCs to present exosome-derived allopeptides to indirect pathway T cells. IAb-IEα52–68 exosomes were i.v. injected into B10 (Thy1.2 congenic) mice previously reconstituted with CFSE-labeled naive (CD44lowCD62Lhigh) 1H3.1 CD4 T cells (Thy1.1 congenic), that bear a TCR transgenic for the IAb-IEα52–68 complex (34). As control, we injected exosomes generated by B10 BMDCs not exposed to IEα52–68 (IAb-irrelevant exosomes). Three days after injection of exosomes, the level of proliferation and phenotype of responder splenic 1H3.1 cells was analyzed by FACS. Division of 1H3.1 CD4 T cells reached a plateau 2–3 days after administration of 20–40 μg of IAb-IEα52–68 exosomes per animal and proliferating 1H3.1 cells acquired the phenotype of activated T cells (CD44high, CD69+) (Fig. 3⇓a). The i.v. administration of IAb-IEα52–68 exosomes did not induce proliferation of 1H3.1 cells in lymph nodes (data not shown), and injection of control IAb-irrelevant exosomes did not activate 1H3.1 cells in vivo (Fig. 3⇓a). Together, these results demonstrate that spleen-resident DCs present exosome-derived allopeptides to indirect pathway CD4 T cells. Exosomes activate indirect pathway CD4 T cells. a, The i.v. injection of IAb-IEα52–68 exosomes in B10 mice (40 μg/mouse) induced proliferation and activation of CFSE-labeled 1H3.1 CD4 T cells, assessed by FACS analysis. Control (IAb-irrelevant) or IAb−/−KO-IEα52–68 exosomes did not activate 1H3.1 cells. b, FACS analysis of activation of 1H3.1 CD4 T cells in WT and MHC-II−/−KO B6 mice, 3 days after i.v. injection of immature or mature IAb-IEα52–68 exosomes. c, FACS analysis of internalization of PKH67-labeled exosomes by splenic DCs of WT and MHC-II−/−KO B6 mice, 3 h after i.v. administration of exosomes. d, Western blot of IAb-IEα52–68 exosomes released by immature and LPS-matured BMDCs. Equal loading of exosomes (20 μg) per lane was confirmed by detection of heat shock protein 70, a marker that is expressed constitutively by exosomes. e, Increasing concentrations of IEα52–68 peptide, or immature or mature IAb-IEα52–68 exosomes, were incubated for 3 h with immature (CD86−) or mature (CD86high) B10 BMDCs from WT or MHC-II−/−KO B6 mice, and used as stimulators of 1H3.1 T cells in a 3-day Ag presentation assay. T cell proliferation was quantified by incorporation of [3H]thymidine. Results are expressed as mean cpm ± SD and are representative of three to five experiments per condition. In a–c, results are representative of n = 3–6 mice per group. Next, we investigated whether the activation of indirect pathway CD4 T cells requires transport of allopeptides by the exosomes in an MHC-dependent or -independent manner. We analyzed activation of CD4 T cells following administration (i.v.) of exosomes released by MHC-II−/−KO B6 (IAb) BMDCs preincubated with IEα52–68 (IAb−/−KO-IEα52–68 exosomes). IAb−/−KO-IEα52–68 exosomes were unable to activate 1H3.1 T cells in vivo (Fig. 3⇑a), indicating that exosomes transport allopeptides as MHC-peptides complexes. To further investigate whether activation in vivo of indirect pathway CD4 T cells by exosomes depended on the presence of host APCs, IAb-IEα52–68 exosomes were i.v. administered to wild-type (WT) mice or MHC-II−/−KO B6 mice, both reconstituted with CFSE-labeled 1H3.1 CD4 T cells. Whereas IAb-IEα52–68 exosomes induced proliferation of 1H3.1 cells in WT mice, they did not trigger 1H3.1 cell activation in MHC-II−/−KO animals (Fig. 3⇑b). The lack of activation of 1H3.1 cells in MHC-II−/−KO mice was not due to deficient uptake of the vesicles because similar percentages of splenic DCs from WT and MHC-II−/−KO mice internalized bloodborne IAb-IEα52–68 exosomes (Fig. 3⇑c). Alternatively, the failure of IAb-IEα52–68 exosomes to activate 1H3.1 cells in MHC-II−/−KO mice could be due to low levels of MHC-peptide complexes present on the surface of immature exosomes obtained from cultures composed predominantly of immature BMDCs. Thus, we conducted similar experiments with IAb-IEα52–68 exosomes obtained from LPS-matured BMDCs (mature exosomes) that contain high levels of MHC-peptide complexes (35). Administration of IAb-IEα52–68 mature exosomes induced a more potent proliferation of 1H3.1 cells compared with that induced by immature vesicles in WT mice (Fig. 3⇑b), a result that correlates with their higher cargo of IAb molecules (Fig. 3⇑d). However, mature exosomes were unable to induce 1H3.1 cell activation in MHC-II−/−KO mice (Fig. 3⇑b). These results indicate that exosomes carrying MHC class II-restricted allopeptides require 1) the presence of “supplementary” MHC class II molecules on the host APCs or 2) to be transferred to the MHC class II molecules on the surface of the APCs. In vitro studies from other laboratories, showing that exosomes activate T cells or T cell clones by transferring “intact” MHC-peptide complexes to DCs seem to contradict our observations (32, 33, 35). Thus, we analyzed this later mechanism in vitro by means of a B6 (IAb) BMDC-dependent Ag-presentation assay that assess proliferation of highly purified naive 1H3.1 cells 3 days later by [3H]thymidine incorporation. IAb-IEα52–68 mature exosomes or free IEα52–68 peptide induced the highest levels of 1H3.1 cell proliferation when incubated with mature WT DCs, whereas immature exosomes were 4- to 6-fold less efficient (Fig. 3⇑e). Addition of IAb-IEα52–68 immature exosomes did not restore the ability of MHC-II−/−KO DCs to induce proliferation of 1H3.1 cells and addition of the highest concentration of mature IAb-IEα52–68 exosomes to MHC-II−/−KO DCs induced poor proliferation of 1H3.1 cells (6- to 8-fold less efficient than the T cell proliferation induced by WT DCs) (Fig. 3⇑e). These results further support our findings in vivo and together they demonstrate that the lack of activation of 1H3.1 CD4 T cells in MHC-II−/−KO mice by circulating exosomes was due to the inability of the vesicles to transfer a sufficient number of MHC-peptides complexes to host DCs. By contrast, the finding that administration of either immature or mature exosomes induces activation of 1H3.1 cells in WT mice (Fig. 3⇑b) suggests that exosomes are a vehicle-to-transfer allopeptides to recipient APCs for indirect allorecognition by CD4 T cells. 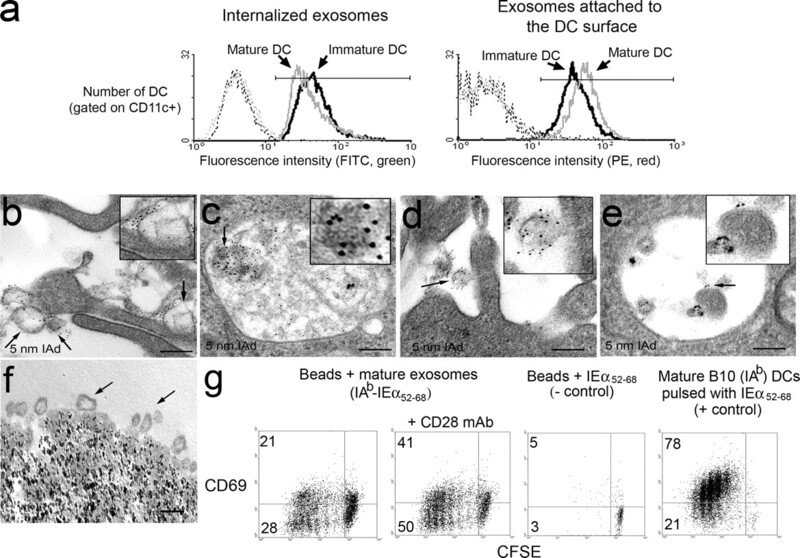 The fact that immature and mature WT BMDCs present exosome-associated allopeptides to T cells, suggests that mature DCs are still capable of internalizing and processing exosomes. We have previously shown that in cocultures of immature and mature BMDCs, exosomes are internalized mainly by immature DCs (12). It is likely that under such conditions, immature DCs with high endocytic ability sequester exosomes efficiently preventing their internalization by the less phagocytic mature DCs. We assessed separately the intrinsic ability of purified immature (CD86−) and LPS-matured (CD86+) BMDCs to internalize H2DCF exosomes. Immature DCs and, to a lesser extent, mature DCs internalized H2DCF exosomes into endocytic vesicles of low pH, as demonstrated by oxidation of H2DCF and generation of dichlorofluorescein green fluorescence assessed by FACS (Fig. 4⇓a). Interaction between exosomes and DCs. a, Right, internalization of H2DCF exosomes by immature BMDCs (black line histogram) and mature BMDCs (gray line histogram), detected by endogenous oxidation of H2DCF into dichlorofluorescein (green fluorescence). Left, binding of H2DCF exosomes on the surface of immature (black line histogram) and mature (gray line histogram) BMDCs, detected in paraformaldehyde-fixed cells by exogenous oxidation of H2DCF into dichlorofluorescein, and labeling with PE anti-FITC Ab (red fluorescence). Control immature BMDCs (black dotted histogram) and mature BMDCs (gray dotted histogram) are indicated. b–e, Ultrastructural analysis of the DC exosome interaction. BALB/c exosomes were labeled with 5-nm gold-conjugated IAd mAb and then incubated with immature and mature B10 (IAb) BMDCs. Thirty minutes later, gold-labeled exosomes were detected attached to the surface and inside endocytic vesicles of both immature (b and c) and mature (d and e) BMDCs. Each inset details exosomes indicated by an arrow. f, Exosomes (arrow) attached to the surface of a 4.5-μm iron bead precoated with CD81 mAb. g, FACS analysis of proliferation of CFSE-labeled 1H3.1 CD4 T cells in response to in vitro stimulation with mature IAb-IEα52–68 exosomes attached to 4.5-μm beads. Electron microscopy is at magnification ×100,000 (b–f). Scale bar represents 100 nm. Data are representative of two (a–e) and four experiments (g). Besides being internalized, exosomes may remain attached or fuse to the DC surface. To assess the amount of exosomes on the DC surface, DCs were incubated with H2DCF exosomes, fixed with paraformaldehyde, oxidized and stained with biotin anti-FITC Ab followed by PE-streptavidin. Because DCs are paraformaldehyde-fixed and the anti-FITC Ab can only reach the cell surface, it is able to distinguish the dichlorofluorescein generated by exogenous oxidation of the H2DCF exosomes attached to the DC surface (green and Ab-labeled in red), from that produced by the H2DCF exosomes internalized and oxidized within vesicles of low pH (only green). Fig. 4⇑a shows that although exosomes bound to immature and mature DCs, more vesicles remained attached to the surface of mature DCs, probably due to their lower endocytic ability. We confirmed our results by immunoelectron microscopy. BALB/c exosomes prelabeled with 5-nm gold-conjugated IAd mAb were incubated with purified immature and mature B10 BMDCs. Following 30 min of incubation, intact 5-nm gold-labeled exosomes were detected on the cell surface and within endocytic vacuoles of immature (Fig. 4⇑, b and c) and mature (Fig. 4⇑, d and e) BMDCs. Next, we tested whether those exosomes attached to the APC surface can stimulate allospecific T cells. We used as a surrogate model, artificial APCs composed of mature IAb-IEα52–68 exosomes attached to 4.5-μm beads precoated with CD81 mAb (2.5, 5, or 10 μg of exosomes per 200,000 beads) (Fig. 4⇑f). In this system, all exosomes remained on the APC surface because they cannot be internalized and reprocessed. The highest concentrations tested of mature IAb-IEα52–68 exosomes on artificial APCs stimulated proliferation of 1H3.1 T cells in vitro, an effect augmented by addition of agonistic CD28 mAb (Fig. 4⇑g). Thus, in the absence of internalization of exosomes, a high cargo of vesicles attached to the APC surface can stimulate proliferation of anti-donor CD4 T cells. Our findings indicate that exosomes transporting allopeptides participate in activation of indirect pathway CD4 T cells. However, because recognition of intact donor MHC molecules by direct pathway T cells is critical for acute rejection (1, 2), we also investigated the role of exosomes in stimulation of direct pathway T cells. B10 mice were untreated or i.v. injected with B10 (control) or BALB/c exosomes, or with BALB/c splenocytes (control). Seven days later, splenic T cells were stimulated with BALB/c, B10, or C3H (third party) CD3-depleted splenic APCs, in 3-day MLR. Administration of BALB/c exosomes (up to 320 μg/mouse, data not shown) did not enhance proliferation of direct pathway T cells when compared with controls (Fig. 5⇓a). Similar results were obtained by ELISPOT analysis for IFN-γ secreted by direct pathway T cells in response to BALB/c, B10, or C3H APCs (data not shown). Graft-derived exosomes and activation of anti-donor T cells. a, Assessment of direct pathway T cell alloreactivity in B10 mice i.v. injected with BALB/c exosomes. Seven days after exosome administration, splenic T cells were stimulated ex vivo with splenic APCs from B10 (syngeneic), BALB/c (allogeneic), or C3H (third party) mice. B10 mice i.v. injected with BALB/c splenocytes were included as positive controls. Results are representative of four experiments with n = 2–3 mice per group. b, Mechanisms by which exosomes might promote T cell allorecognition in transplantation. c, Serum exosomes purified from recipient (B10) mice, 3 and 7 days after transplantation of cardiac or skin allografts (BALB/c) were analyzed by electron microscopy, labeled with PKH67 for traffic studies or pooled and adoptively transferred (i.v.) into B10 mice reconstituted with CFSE-labeled 1H3.1 CD4 T cells for in vivo studies. Mice untreated and immunized with free IEα52–68 peptide plus IFA were included as controls. Three days later, activation and proliferation of 1H3.1 cells was assessed by FACS. Results are representative of n = 4 mice per group. For in vitro studies, B10 BMDCs were pulsed with serum exosomes and used as simulators of 1H3.1 CD4 T cells in 3-day Ag-presentation assays. Our results demonstrated that allografts are infiltrated by GILs that release exosomes (Fig. 1⇑) and that exosomes promote activation of indirect pathway T cells through interaction with DCs (Fig. 3⇑, a and b). However, whether GILs can activate anti-donor T cells in secondary lymphoid organs by releasing exosomes carrying alloantigen into systemic circulation is unknown (Fig. 5⇑b, top). Thus, we tested the ability of serum exosomes from B10 recipients of vascularized (heart) or nonvascularized (skin) BALB/c allografts to interact with splenic DCs and elicit proliferation of indirect pathway CD4 T cells in the spleen (Fig. 5⇑c). Exosomes purified from serum 3 and 7 days after transplantation were composed of vesicles with the typical cup-shaped morphology ranging between 40 and 120 μm in size (Fig. 5⇑c). Serum exosomes from the B10 recipient mice were labeled with PKH67 and i.v. injected into host B10 mice, where the vesicles were rapidly (within 3 h) captured by marginal zone DCs and metallophillic macrophages and by red pulp macrophages of the spleen (Fig. 5⇑c). Adoptive transference (i.v.) 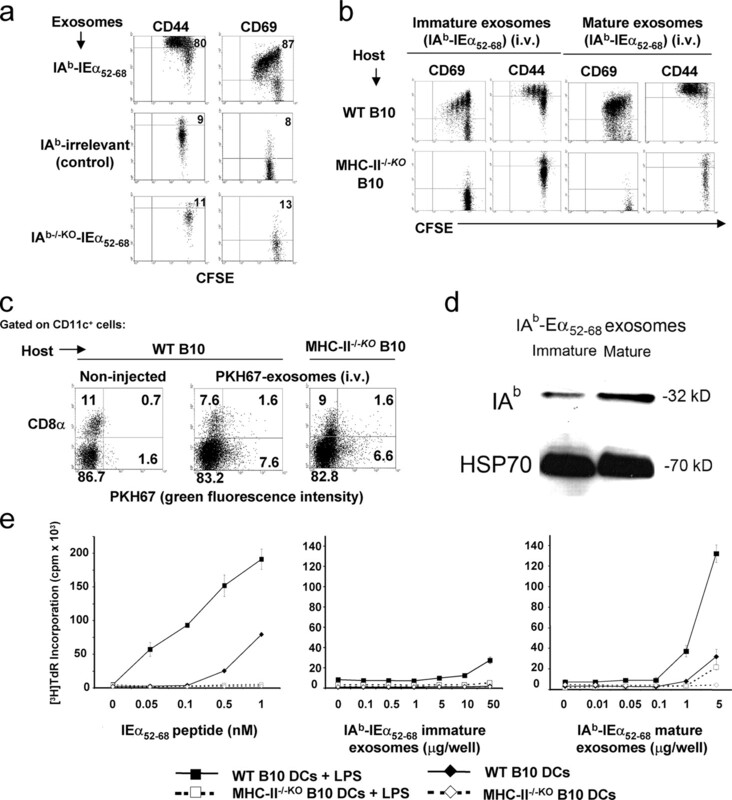 of serum exosomes from the B10 recipients into host B10 mice reconstituted with CFSE-labeled 1H3.1 cells did not elicit activation of indirect pathway CD4 T cells in vivo (Fig. 5⇑c). Similar results were obtained in vitro when B10 BMDCs were pulsed (3 h, 37°C) with increasing concentrations of serum exosomes from the B10 recipients and used as stimulators of 1H3.1 T cells in 3-day MLR. Together, these results suggest that GILs do not secrete enough amounts of exosomes into circulation to stimulate anti-donor T cells in the spleen. Next, we investigated whether DCs mobilized to secondary lymphoid organs use exosomes as a short-range mechanism to interact with neighboring DCs (Fig. 5⇑b, bottom). We addressed this question by using DCs able to 1) sort a reporter protein specifically into exosomes, 2) release exosomes carrying the reporter protein, and 3) home in the spleen. BMDCs from Fas−/−KO B6 mice were transduced with a RAd encoding for the sequence of eGFP linked to a 10 aa N-terminal truncation of mouse FasL (RAd-FasL-eGFP) (36), or with control RAd-GFP. The FasL-eGFP construct contains the proline-rich domains and the lysine residues of the FasL tail (Fig. 6⇓a) that allows eGFP to be sorted directly from the Golgi to MVBs and exosomes, without trafficking through the plasma membrane (37, 38). 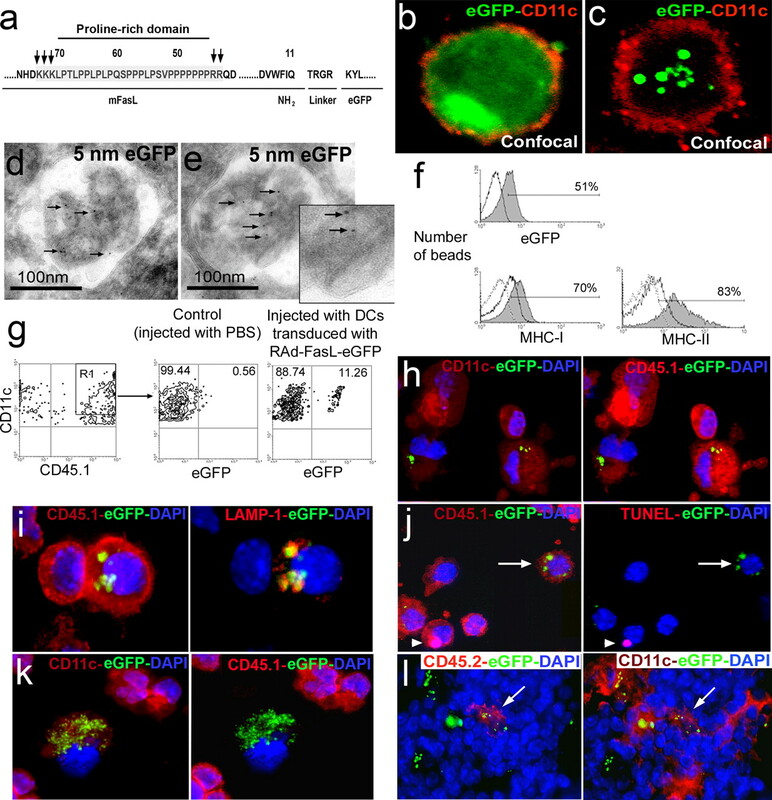 Control RAd-eGFP-BMDCs expressed eGFP diffusively in the cytoplasm and nucleus (Fig. 6⇓b). By contrast, RAd-FasL-eGFP BMDCs concentrated eGFP in the lumen of exosomes in MVBs (Fig. 6⇓, c–e) and released exosomes expressing eGFP and high levels of MHC molecules (Fig. 6⇓f), the latter likely due to RAd-induced maturation of DCs (39). Migrating DCs transfer exosomes to DCs of secondary lymphoid organs. a, Structure of the fusion protein encoded by RAd-FasL-eGFP, with eGFP followed by a linker and the cytoplasmic tail of mouse FasL containing the proline-rich domains (PRDs) flanked by the basic residues arginine (R) and lysine (L) that are required for sorting into MVBs and exosomes. b and c, BMDCs transduced with control RAd-eGFP expressed eGFP diffusely (b), whereas BMDCs infected with RAd-FasL-eGFP concentrated eGFP in cytoplasmic vesicles (c). d and e, Ultrastructural localization of eGFP in the lumen of exosomes in MVBs of RAd-FasL-eGFP-BMDCs by labeling with 5-nm gold-conjugated anti-GFP mAb (arrow indicates inset). f, Phenotype of exosomes released by RAd-FasL-eGFP BMDCs attached to beads and analyzed by FACS. g, Detection by FACS analysis of transference of eGFP exosomes between i.v. injected RAd-FasL-eGFP BMDCs (CD45.2+) and splenic CD11c+ DCs of CD45.1 congenic hosts. h–l, Sixteen hours after i.v. 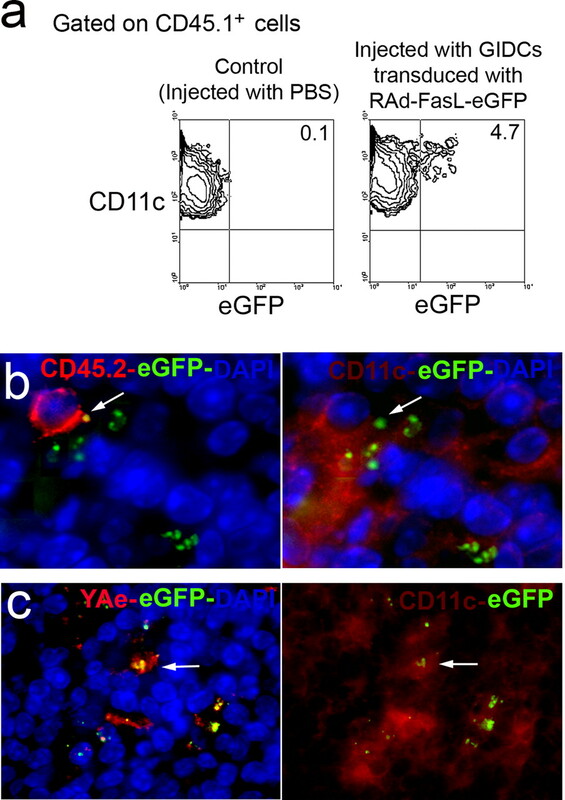 injection of RAd-FasL-eGFP BMDCs (CD45.2+) into CD45.1 congenic hosts, the transference of eGFP exosomes to host splenic DCs was analyzed by four-color fluorescence microscopy in cytospins. Splenic DCs (CD11c+) of the host mice (CD45.1+) contained eGFP+ vesicles (h), that coexpressed LAMP-1 (i), and were TUNEL-negative (j). j, Host splenic DC with eGFP+ TUNEL-negative vesicles (arrow) and a DC with a TUNEL-positive fragment (arrowhead) that is eGFP− are shown. k, The i.v. injected RAd-FasL-eGFP BMDCs were distinguished from the acceptor splenic DCs by their lack of CD45.1 and high content of eGFP+ vesicles. l, Section of spleen showing an adoptively transferred DC (CD45.2+, arrow) surrounded by host DCs (CD45.2−) with intracellular eGFP. Confocal microscopy is at a magnification ×400 (b and c). Fluorescence microscopy is at ×400 (h–l). Nuclei were stained with DAPI. Immunoelectron microscopy is ×100,000 (d and e). Next, we tested whether RAd-FasL-eGFP BMDCs (CD45.2+) i.v. injected into CD45.1 congenic B6 mice transfer exosomes to DCs of the spleen. To rule out a possible carryover effect due to the presence of free RAd, controls were injected with PBS collected from the last wash of RAd-FasL-eGFP BMDCs. Sixteen hours after transference of RAd-FasL-eGFP BMDCs, 9–12% of splenic CD45.1+ DCs expressed eGFP, compared with <1% of DCs in controls (Fig. 6⇑g). In cytospins, the splenic “acceptor” (CD45.1+) DCs contained the internalized cargo expressing eGFP in three to five cytoplasmic vesicles (Fig. 6⇑h), positive for LAMP-1 (Fig. 6⇑i) and negative for TUNEL (Fig. 6⇑j), indicating that the phenomenon was not caused by internalization of apoptotic cell fragments derived from the injected DCs. By contrast, the transferred RAd-FasL-eGFP BMDCs expressed CD45.2 and contained numerous eGFP-labeled vesicles in the cytoplasm (Fig. 6⇑k). In sections of spleens, the adoptively transferred BMDCs (CD11c+ CD45.2+) containing green vesicles were surrounded by numerous splenic DCs from the host (CD11c+, CD45.2−) with eGFP+ inclusions (Fig. 6⇑l). Together, these results suggest that when bloodborne DCs home in the spleen, they release exosomes that are captured by neighboring DCs of the lymphoid organ. Next, we tested whether DCs mobilized from allografts disseminate alloantigens to recipient’s DCs through the local release of exosomes in secondary lymphoid organs. GIDCs (CD11c+) isolated from BALB/c (CD45.2+) cardiac grafts 3 days after transplantation in B10 (CD45.2+) recipient mice were transduced ex vivo with RAd-FasL-eGFP (RAd-FasL-eGFP GIDCs) and adoptively transferred (i.v.) into CD45.1 congenic B6 mice (5 × 106 GIDCs pooled from four grafts/per mouse). Controls were injected with PBS collected from the last wash of the RAd-FasL-GFP GIDCs. Sixteen hours after transference of RAd-FasL-eGFP GIDCs, 4–6% of the host (CD45.1+) DCs acquired eGFP by FACS analysis (Fig. 7⇓a). In tissue sections, the transferred RAd-FasL-GFP GIDCs (CD45.2+) that homed in the spleen were surrounded by DCs from the host (CD45.2−) with intracellular eGFP+ vesicles (Fig. 7⇓b). Numerous of these eGFP+ vesicles carry the IAb-IEα52–68 complex identified by labeling with the Y-Ae mAb (Fig. 7⇓c), suggesting that transference of exosomes might facilitate locally the spreading of allopeptides between DCs in secondary lymphoid organs. Exosomes and spreading of alloantigen between DCs. a, FACS analysis of transfer of eGFP exosomes between i.v. injected RAd-FasL-eGFP GIDCs (CD45.2+) and splenic CD11c+ DCs of CD45.1 congenic hosts. b, Section of spleen showing an adoptively transferred GIDCs transduced with RAd-FasL-eGFP (CD45.2+, arrow) surrounded by host DCs (CD45.2−) with internalized eGFP. c, Splenic DCs with vesicles containing eGFP+ material and the IAb-IEα52–68 complex, identified with the Y-Ae mAb. Fluorescence microscopy is at a magnification ×400. Nuclei were stained with DAPI. Data are representative of three independent experiments. In transplantation, the role of exosomes during allorecognition has not been elucidated (28). Exosomes released by APCs and expressing MHC-peptide complexes, adhesion and costimulatory molecules could function as Ag-presenting vesicles or as acellular vehicles to spread alloantigens between APCs (13, 14). We demonstrated in this study that grafts are infiltrated by leukocytes, mainly DCs, able to release exosomes that can transport donor MHC molecules or allopeptides associated to self-MHC Ag or to chaperone molecules such as heat shock protein 70 (40). Although high concentrations of exosomes can activate weakly T cell clones or T cell lines (17, 41), exosomes alone fail to stimulate naive T cells (10, 42). This weak stimulatory ability of exosomes has been ascribed to their low ability to cross-link TCRs and deliver costimulation, small size or membrane composition. By contrast, exosomes activate T cells efficiently when they interact with DCs (10, 35, 41). In this regard, our results have shown that bloodborne exosomes carrying alloantigen are trapped rapidly by myeloid, lymphoid, and plasmacytoid DCs of the spleen. These DCs internalize exosomes into endocytic vesicles of low pH where the exosome-derived alloantigens are processed for presentation to anti-donor T cells (12). The nature of the interaction between exosomes and DCs is not completely understood. Previous studies have shown that under certain conditions exosomes remain attached to the APC surface, as occurs in follicular DCs (43) or transfer intact MHC-peptide complexes to DCs (33, 35). Our results indicate that exosomes first bind to the APC surface and then are internalized into endocytic vesicles by immature and mature DCs. The finding that exosomes carrying IAb-IEα52–68 complexes activate indirect pathway CD4 T cells in WT animals, but not in MHC class II−/−KO mice, suggests that in our model the transference of MHC-peptide complexes between exosomes and splenic DCs is not an efficient mechanism to elicit T cell activation in vivo. These findings agree with our results in vitro and are compatible with a model where exosomes are internalized by the APCs and transfer allopeptides to DCs in secondary lymphoid organs. However, in the absence of internalization an elevated number of exosomes on the APC surface can activate, at least in vitro, CD4 T cells. In agreement with our findings, a previous study has shown that stimulation of T cells specific for the IAb-H-Y-derived peptide complex in response to H-Y-exosomes is much less efficient in MHC class II-deficient hosts (10). More recently, Mallegol et al. (44) have shown in vitro that HLA-DR4− DCs did not present the HLA-DR4-restricted albumin 64–76 peptide following incubation with exosomes bearing the HLA-DR4 albumin 64–76 peptide complex, suggesting that DC-derived, instead of exosome-derived, MHC class II molecules are responsible for presentation to T cells. Whether release of DC-derived exosomes occurs in periphery or after migration of DCs to secondary lymphoid tissues is unknown. Exosomes produced in periphery could traffic through the lymph or blood to lymphoid organs and be reprocessed by lymphoid tissue-DCs. Instead, migrating DCs homed in spleen or lymph nodes could transfer exosomes locally to DCs in lymphoid organs. There is indirect evidence that exosomes released into blood by different tissues can regulate systemically T cell responses. Pregnant women release into circulation placenta-derived exosomes expressing FasL and programmed cell death-ligand 1 that down-regulate T cell activation (45), and sera from cancer patients contain neoplasm-derived exosomes that suppress T cell signaling in vitro (46). Intestinal epithelial cells release into serum exosomes carrying food-derived peptides that could play a role in oral tolerance (47). However, our results with serum exosomes indicate that in transplantation, GILs do not release enough quantity of exosomes into systemic circulation to stimulate anti-donor T cells in secondary lymphoid organs. This result seems to contradict the previous observations that MHC-rich exosomes are released by different types of cells in culture (10, 12, 17, 22, 23, 33, 35, 41, 44), and that soluble MHC molecules have been detected in serum of humans and mice (48, 49). However, a recent study has shown that in healthy volunteers, soluble forms of MHC Ag are not exosome-associated (30), suggesting that exosomes might have a short half-life in serum due to possible degradation in circulation or clearance by phagocytes of the spleen, liver, and lung, as we have demonstrated in this study. Alternatively, DCs mobilized from the graft to the recipient’s lymphoid organs as passenger leukocytes could use exosomes as a “short-range” mechanism to transfer allopeptides to neighboring DCs, which have not been previously in contact with the alloantigen. We explored this mechanism in vivo, by transferring adoptively in vitro-generated BMDCs able to sort the reporter protein eGFP from the Golgi specifically to exosomes in MVBs, without transiting the cell surface (37, 38). This model allowed us to follow in vivo the transference of eGFP-labeled exosomes from migrating DCs to spleen-resident DCs, the later identified by the expression of a congenic marker. With the same approach, we found that GIDCs mobilized to the spleen also transfer eGFP-exosomes to splenic DCs and that numerous vesicles with internalized eGFP+ material contained donor-derived allopeptides associated to MHC class II molecules. Why exosomes might be more important than soluble allopeptides to transfer alloantigen between DCs? The answer may rely on the fact that particulate Ag internalized into phagosomes are presented 103- to 104-fold more efficiently by MHC class II molecules (50), and on the recent finding by Mallegol et al. (44), who demonstrated in vitro that transference of antigenic peptides through exosomes to DCs is significantly more efficient than delivery of free peptide. One of the obstacles in the study of the role of exosomes in immunity or tolerance is the incomplete information on the interaction of these vesicles with leukocytes. Our data suggest that release of exosomes might represent an important mechanism used by DCs to elicit or amplify the anti-donor T cell response that leads to graft rejection. Engineering of DCs to release tolerogenic exosomes may be useful to prevent/ameliorate transplant rejection or autoimmune disorders. ↵1 This work was supported by Grants R01 HL075512 and HL077545 (to A.E.M. ), and R01 CA100893 (A.T.L.) from the National Institutes of Health. ↵3 Abbreviations used in this paper: DC, dendritic cell; BMDC, bone marrow-derived DC; GIDC, graft-infiltrating DC; GIL, graft-infiltrating leukocyte; MVB, multivesicular body; RAd, recombinant adenovirus; eGFP, enhanced GFP; FasL, Fas ligand; LAMP, lysosomal-associated membrane protein; MFG-E8, milk fat globule-E8; WT, wild type. Gould, D. S., H. Auchincloss, Jr. 1999. Direct and indirect recognition: the role of MHC antigens in graft rejection. Immunol. Today 20: 77-82. Morelli, A. E., A. W. Thomson. 2003. Dendritic cells: regulators of alloimmunity and opportunities for tolerance induction. Immunol. Rev. 196: 125-146. Larsen, C. P., P. J. Morris, J. M. Austyn. 1990. Migration of dendritic leukocytes from cardiac allografts into host spleens: a novel pathway for initiation of rejection. J. Exp. Med. 171: 307-314. Larsen, C. P., R. M. Steinman, M. Witmer-Pack, D. F. Hankins, P. J. Morris, J. M. Austyn. 1990. Migration and maturation of Langerhans cells in skin transplants and explants. J. Exp. Med. 172: 1483-1493. Smyth, L. A., B. Afzali, J. Tsang, G. Lombardi, R. I. Lechler. 2007. Intercellular transfer of MHC and immunological molecules: molecular mechanisms and biological significance. Am. J. Transplant. 7: 1442-1449. Harshyne, L. A., S. C. Watkins, A. Gambotto, S. M. Barratt-Boyes. 2001. Dendritic cells acquire antigens from live cells for cross-presentation to CTL. J. Immunol. 166: 3717-3723. Albert, M. L., B. Sauter, N. Bhardwaj. 1998. Dendritic cells acquire antigen from apoptotic cells and induce class I-restricted CTLs. Nature 392: 86-89. Morelli, A. E., A. T. Larregina, W. J. Shufesky, A. F. Zahorchak, A. J. Logar, G. D. Papworth, Z. Wang, S. C. Watkins, L. D. Falo, Jr, A. W. Thomson. 2003. Internalization of circulating apoptotic cells by splenic marginal zone dendritic cells: dependence on complement receptors and effect on cytokine production. Blood 101: 611-620. Thery, C., L. Duban, E. Segura, P. Veron, O. Lantz, S. Amigorena. 2002. Indirect activation of naive CD4+ T cells by dendritic cell-derived exosomes. Nat. Immunol. 3: 1156-1162. Skokos, D., H. G. Botros, C. Demeure, J. Morin, R. Peronet, G. Birkenmeier, S. Boudaly, S. Mecheri. 2003. Mast cell-derived exosomes induce phenotypic and functional maturation of dendritic cells and elicit specific immune responses in vivo. J. Immunol. 170: 3037-3045. Morelli, A. E., A. T. Larregina, W. J. Shufesky, M. L. Sullivan, D. Beer Stolz, G. D. Papworth, A. F. Zahorchak, A. J. Logar, Z. Wang, S. C. Watkins, et al 2004. Endocytosis, intracellular sorting, and processing of exosomes by dendritic cells. Blood 104: 3257-3266. Thery, C., L. Zitvogel, S. Amigorena. 2002. Exosomes: composition, biogenesis and function. Nat. Rev. Immunol. 2: 569-579. Stoorvogel, W., M. J. Kleijmeer, H. J. Geuze, G. Raposo. 2002. The biogenesis and functions of exosomes. Traffic 3: 321-330. Pan, B. T., R. M. Johnstone. 1983. Fate of the transferrin receptor during maturation of sheep reticulocytes in vitro: selective externalization of the receptor. Cell 33: 967-978. Johnstone, R. M., M. Adam, J. R. Hammond, L. Orr, C. Turbide. 1987. Vesicle formation during reticulocyte maturation: association of plasma membrane activities with released vesicles (exosomes). J. Biol. Chem. 262: 9412-9420. Raposo, G., H. W. Nijman, W. Stoorvogel, R. Liejendekker, C. V. Harding, C. J. Melief, H. J. Geuze. 1996. B lymphocytes secrete antigen-presenting vesicles. J. Exp. Med. 183: 1161-1172. Denzer, K., M. J. Kleijmeer, H. F. Heijnen, W. Stoorvogel, H. J. Geuze. 2000. Exosome: from internal vesicle of the multivesicular body to intercellular signaling device. J. Cell Sci. 113: 3365-3374. Gould, S. J., A. M. Booth, J. E. Hildreth. 2003. The Trojan exosome hypothesis. Proc. Natl. Acad. Sci. USA 100: 10592-10597. Fevrier, B., D. Vilette, H. Laude, G. Raposo. 2005. Exosomes: a bubble ride for prions?. Traffic 6: 10-17. Valadi, H., K. Ekström, A. Bossios, M. Sjöstrand, J. J. Lee, J. O. Lötvall. 2007. Exosome-mediated transfer of mRNAs and microRNAs is a novel mechanism of genetic exchange between cells. Nat. Cell Biol. 9: 654-659. Zitvogel, L., A. Regnault, A. Lozier, J. Wolfers, C. Flament, D. Tenza, P. Ricciardi-Castagnoli, G. Raposo, S. Amigorena. 1998. Eradication of established murine tumors using a novel cell-free vaccine: dendritic cell-derived exosomes. Nat. Med. 4: 594-600. Chaput, N., N. E. Schartz, F. Andre, J. Taieb, S. Novault, P. Bonnaventure, N. Aubert, J. Bernard, F. Lemonnier, M. Merad, et al 2004. Exosomes as potent cell-free peptide-based vaccine. II. Exosomes in CpG adjuvants efficiently prime naive Tc1 lymphocytes leading to tumor rejection. J. Immunol. 172: 2137-2146. Peche, H., K. Renaudin, G. Beriou, E. Merieau, S. Amigorena, M. C. Cuturi. 2006. Induction of tolerance by exosomes and short-term immunosuppression in a fully MHC-mismatched rat cardiac allograft model. Am. J. Transplant. 6: 1541-1550. Kim, S. H., E. R. Lechman, N. Bianco, R. Menon, A. Keravala, J. Nash, Z. Mi, S. C. Watkins, A. Gambotto, P. D. Robbins. 2005. Exosomes derived from IL-10-treated dendritic cells can suppress inflammation and collagen-induced arthritis. J. Immunol. 174: 6440-6448. Morelli, A. E.. 2006. The immune regulatory effect of apoptotic cells and exosomes on dendritic cells: its impact on transplantation. Am. J. Transplant. 6: 254-261. Lamparski, H. G., A. Metha-Damani, J. Y. Yao, S. Patel, D. H. Hsu, C. Ruegg, J. B. Le Pecq. 2002. Production and characterization of clinical grade exosomes derived from dendritic cells. J. Immunol. Methods 270: 211-226. MacKay, P. A., S. Leibundgut-Landmann, N. Koch, A. C. Dunn, W. Reith, R. W. Jack, A. D. McLellan. 2006. Circulating, soluble forms of major histocompatibility complex antigens are not exosome-associated. Eur. J. Immunol. 36: 2875-2884. Wang, Z., A. Castallaneta, A. De Creus, W. J. Shufesky, A. E. Morelli, A. W. Thomson. 2004. Heart, but not skin, allografts from donor lacking Flt3 ligand exhibit markedly prolonged survival time. J. Immunol. 172: 5924-5930. Andre, F., N. E. Schartz, M. Movassagh, C. Flament, P. Pautier, P. Morice, C. Pomel, C. Lhomme, B. Escudier, T. Le Chevalier, et al 2002. Malignant effusions and immunogenic tumour-derived exosomes. Lancet 360: 295-305. Andre, F., N. Chaput, N. E. Schartz, C. Flament, N. Aubert, J. Bernard, F. Lemonnier, G. Raposo, B. Escudier, D. H. Hsu, et al 2004. Exosomes as potent cell-free peptide-based vaccine. I. Dendritic cell-derived exosomes transfer functional MHC class I/peptide complexes to dendritic cells. J. Immunol. 172: 2126-2136. Viret, C., C. A. Janeway, Jr. 2000. Functional and phenotypic evidence for presentation of Eα 52–68 structurally related self-peptide(s) in I-Eα-deficient mice. J. Immunol. 164: 4627-4634. Segura, E., C. Nicco, B. Lombard, P. Veron, G. Raposo, F. Batteux, S. Amigorena, C. Thery. 2005. ICAM-1 on exosomes from mature dendritic cells is critical for efficient naive T-cell priming. Blood 106: 216-223. Rubinchik, S., R. Ding, A. J. Qiu, F. Zhang, J. Dong. 2000. Adenoviral vector which delivers FasL-GFP fusion protein regulated by the tet-inducible expression system. Gene Ther. 7: 875-885. Blott, E. J., G. Bossi, R. Clark, M. Zvelebil, G. M. Griffiths. 2001. Fas ligand is targeted to secretory lysosomes via a proline-rich domain in its cytoplasmic tail. J. Cell Sci. 114: 2405-2416. Zuccato, E., E. J. Blott, O. Holt, S. Sigismund, M. Shaw, G. Bossi, G. M. Griffiths. 2007. Sorting of Fas ligand to secretory lysosomes is regulated by mono-ubiquitylation and phosphorylation. J. Cell Sci. 120: 191-199. Morelli, A. E., A. T. Larregina, R. W. Ganster, A. F. Zahorchak, J. M. Plowey, T. Takayama, A. J. Logar, P. D. Robbins, L. D. Falo, A. W. Thomson. 2000. Recombinant adenovirus induces maturation of dendritic cells via an NF-κB-dependent pathway. J. Virol. 74: 9617-9628. Thery, C., A. Regnault, J. Garin, J. Wolfers, L. Zitvogel, P. Ricciardi-Castagnoli, G. Raposo, S. Amigorena. 1999. Molecular characterization of dendritic cell-derived exosomes: selective accumulation of the heat shock protein hsc73. J. Cell Biol. 147: 599-610. Vincent-Schneider, H., P. Stumptner-Cuvelette, D. Lankar, S. Pain, G. Raposo, P. Benaroch, C. Bonnerot. 2002. Exosomes bearing HLA-DR1 molecules need dendritic cells to efficiently stimulate specific T cells. Int. Immunol. 14: 713-722. Kovar, M., O. Boyman, X. Shen, I. Hwang, R. Kohler, J. Sprent. 2006. Direct stimulation of T cells by membrane vesicles from antigen-presenting cells. Proc. Natl. Acad. Sci. USA 103: 11671-11676. Denzer, K., M. van Eijk, M. J. Kleijmeer, E. Jakobson, C. de Groot, H. J. Geuze. 2000. Follicular dendritic cells carry MHC class II-expressing microvesicles at their surface. J. Immunol. 165: 1259-1265. Mallegol, J., G. Van Niel, C. Lebreton, Y. Lepelletier, C. Candalh, C. Dugave, J. K. Heath, G. Raposo, N. Cerf-Bensussan, M. Heyman. 2007. T84-intestinal epithelial exosomes bear MHC class II/peptide complexes potentiating antigen presentation by dendritic cells. Gastroenterology 132: 1866-1876. Taylor, D. D., S. Akyol, C. Gercel-Taylor. 2006. Pregnancy-associated exosomes and their modulation of T cell signaling. J. Immunol. 176: 1534-1542. Karlsson, M., S. Lundin, U. Dahlgren, H. Kahu, I. Pettersson, E. Telemo. 2001. “Tolerosomes” are produced by intestinal epithelial cells. Eur. J. Immunol. 31: 2892-2900. Charlton, R. K., C. M. Zmijewski. 1970. Soluble HL-A7 antigen: localization in the β-lipoprotein fraction of human serum. Science 170: 636-637. Callahan, G. N., S. Ferrone, J. P. Allison, R. A. Reisfeld. 1975. Detection of H-2 antigens in serum. Transplantation 20: 431-433. Rock, K. L., K. Clark. 1996. Analysis of the role of MHC class II presentation in the stimulation of cytotoxic T lymphocytes by antigens targeted into the exogenous antigen-MHC class I presentation pathway. J. Immunol. 156: 3721-3726.